I am so glad to hear the skinny on Dinner A'fare! I have been to Let's Dish and had a similar experience. I want to give this place a try. 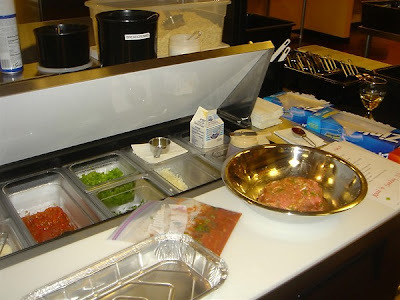 It is just so nice to have meals ready to go in the freezer. Plus, it is so much cheaper than going out to eat. My girl friend were going to do Super Suppers a few months ago and then the Chateau Elan one moved (closed? moved?) and we never did. I just saw an ad for Dinner A'fare this morning so I am glad to hear a review and I will have to put it back on my "to do" list! Happy 4th! That looks like a really neat place. I would love to see if Dallas has something like that. I love your blog....I read down some of your post and saw the hanky panky post...I'm officially addicted and can't bear the thought of wearing anything else! So glad y'all had fun! I've been wanting to try one of these places for years now and will definitly need to plan a girls night at some point. Love that you can do the 1/2 portions too- great idea if you don't have a big ole family to feed. I've been doing Pass Your Plate every month with a friend for almost 2 years. Sadly, they are closing the store we go to. 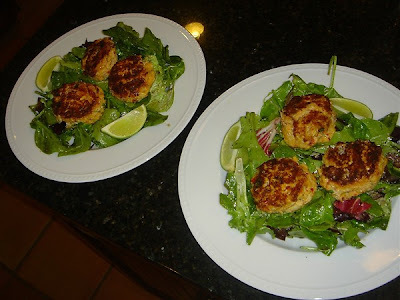 Your crab cakes look amazing! I love chili powder! This sounds like so much fun & your crabcake look delish! We have a Dinner A'Fare here & I can't wait to go there.